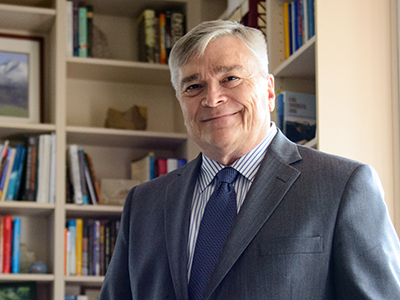 Dr. Eric J. Barron began his tenure as the 18th president of Penn State in May 2014. Since then, he has crisscrossed the state, and has been a strong voice for economic development, students, faculty, research and other issues critical to higher education and the Commonwealth. Dr. Barron returned to Penn State from the helm at Florida State, bringing with him nearly 35 years of leadership experience in academic administration, education, research, and public service, and a track record as a talented manager of fiscal policy within large and complex organizations. Dr. Barron spent 20 years of his career at Penn State. He was named a Distinguished Professor of Geosciences in 1999 and served as dean of the College of Earth and Mineral Sciences from 2002 to 2006. An accomplished scientist with a long background in atmospheric and oceanic research, Dr. Barron previously served as director of the National Center for Atmospheric Research and as dean of the Jackson School of Geosciences at the University of Texas at Austin. True to his roots in geology, he is an avid collector of rocks and minerals. He has also made a New Year’s resolution to walk 10,000 steps a day, which will require turning off his email from time to time.